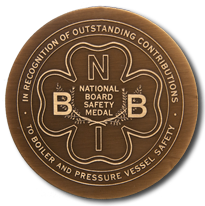 The National Board of Boiler and Pressure Vessel Inspectors is seeking nominations for the 2019 Safety Medal award. This award, the highest honor bestowed by the National Board, will be presented at the 88th General Meeting in Salt Lake City, Utah, May 6-10, 2019. To be considered for the Safety Medal, letters of recommendation must be submitted by three individuals who are acquainted with the candidate and can attest to his or her safety contributions within the boiler and pressure vessel industry. At least two of the letters must be from National Board members. The name, title, employer, and business address of the candidate. A listing of specific candidate contributions or achievements relative to the award.